Size: 721 sq.ft. - 2368 sq.ft. The newest multi-tower development named Beachfront by Emaar Group in Dubai Harbour consisting Beachfront apartments. This project by Emaar is an exclusive coastal community comprising 27 exceptional towers. The development has direct beach access, with 1.5 km of beachfront. The project will be split between 7,000 luxury waterfront apartments in offering 1 to 4 bedroom options including a five-star hotel. The apartments will feature Miami-style interiors with generous balcony space and unobstructed ocean views. Emaar beachfront project will take the standards of high-end lifestyle to a new stunning level. Emaar Properties is developing approx 10.2 million sq.ft. GFA for Emaar Beachfront which is divided into 4 major segments such as 9.5 million sq.ft. for Residential, 140,000 sq.ft. for Retail purpose and 323000 sq.ft. for Hotel and 268000 sq.ft. for the worldclass features of Beachfront community. The 1st estate to be announced at Beachfront is "Beach Vista" - a state of the art apartment building comprising two stately towers connected by a podium level with a swimming pool. Beach Vista will offer 1 Bed, 2 Bed, 3 Bed, and 4 Bed room apartments. Each Apartments in Beach Vista will feature views of the Arabian Gulf. The Project Beachfront is conveniently positioned in Dubai Harbour with one of the city’s future architectural marvel "the Dubai Lighthouse". Dubai Harbour is sprawled over 20 million sq. feet that include a 1400-berth marina as well as a cruise ship port and terminal, a shopping mall covering 3.5 million sq. ft. The Residents of Beachfront will have uninterrupted access to their homes from King Salman bin Abdulaziz Al Saud Street - a bridge that connects them directly from Sheikh Zayed Road and monorail that link to the metro from both Bluewaters Island and Palm Jumeirah. Emaar Properties was founded by Mohamed Ali Rashed Al-Abbar on June 23, 1997 and and is headquartered in Dubai, United Arab Emirates. The company also has a diversified real estate development portfolio extending across hospitality & leisure, shopping malls & retail. Emaar group has constrcuted and delivered many marvellous constructions in Dubai and in other countries as well. 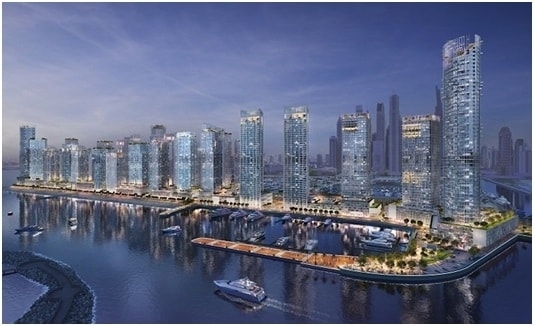 Emaar "Beachfront" Development is located at Marsa Dubai in the beach strip of Dubai Harbour(750 Meter), Dubai, UAE. The resident of Beachfront project enjoys various leisure amenities such as an events arena, hotels, offices, retail stores, public services, restaurants, cafes, shopping mall, yacht club, hotels, iconic structures including a 135-meter high Dubai Lighthouse, a 150,000 square feet cruise liner terminal that can accommodate over 6000 passengers.